Concepts of Genetics emphasizes the fundamental ideas of genetics, while exploring modern techniques and applications of genetic analysis. This best-selling text continues to provide understandable explanations of complex, analytical topics and recognizes the importance of teaching students how to become effective problem solvers. The 12th Edition has been extensively updated to provide comprehensive coverage of important, emerging topics such as CRISPR-Cas and the study of posttranscriptional gene regulation in eukaryotes. An expanded emphasis on ethical considerations that genetics is bringing into everyday life is addressed in Genetics, Ethics, and Society and Case Study features. The accompanying Mastering™ Genetics online platform is updated with new tutorials and Dynamic Study Modules. Mastering™ is the teaching and learning platform that empowers you to reach every student. By combining trusted author content with digital tools developed to engage students and emulate the office-hour experience, Mastering personalizes learning and improves results for each student. With a wide range of interactive, engaging, and assignable activities, students are encouraged to actively learn and retain tough course concepts. Note: You are purchasing a standalone product; Mastering Genetics does not come packaged with this content. 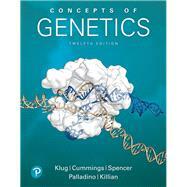 Students, if interested in purchasing this title with Mastering Genetics , ask your instructor for the correct package ISBN and Course ID. Instructors, contact your Pearson representative for more information. William S. Klug is an Emeritus Professor of Biology at The College of New Jersey (formerly Trenton State College) in Ewing, New Jersey, where he served as Chair of the Biology Department for 17 years. He received his B.A. degree in Biology from Wabash College in Crawfordsville, Indiana, and his Ph.D. from Northwestern University in Evanston, Illinois. Prior to coming to The College of New Jersey, he was on the faculty of Wabash College as an Assistant Professor, where he first taught genetics, as well as general biology and electron microscopy. His research interests have involved ultrastructural and molecular genetic studies of development, utilizing oogenesis in Drosophila as a model system. He has taught the genetics course as well as the senior capstone seminar course in Human and Molecular Genetics to undergraduate biology majors for over four decades. He was the recipient in 2001 of the first annual teaching award given at The College of New Jersey, granted to the faculty member who “most challenges students to achieve high standards.” He also received the 2004 Outstanding Professor Award from Sigma Pi International, and in the same year, he was nominated as the Educator of the Year, an award given by the Research and Development Council of New Jersey. When he is away from revision files and reading the genetic literature, he can often be found paddling in the Gulf of Mexico or in Maine's Pebobscot Bay. Michael R. Cummings is Research Professor in the Department of Biological, Chemical, and Physical Sciences at Illinois Institute of Technology, Chicago, Illinois. For more than 25 years, he was a faculty member in the Department of Biological Sciences and in the Department of Molecular Genetics at the University of Illinois at Chicago. He has also served on the faculties of Northwestern University and Florida State University. He received his B.A. from St. Mary’s College in Winona, Minnesota, and his M.S. and Ph.D. from Northwestern University in Evanston, Illinois. In addition to this text and its companion volumes, he has also written textbooks in human genetics and general biology for nonmajors. His research interests center on the molecular organization and physical mapping of the heterochromatic regions of human acrocentric chromosomes. At the undergraduate level, he teaches courses in Mendelian and molecular genetics, human genetics, and general biology, and has received numerous awards for teaching excellence given by university faculty, student organizations, and graduating seniors. Charlotte A. Spencer is a retired Associate Professor from the Department of Oncology at the University of Alberta in Edmonton, Alberta, Canada. She has also served as a faculty member in the Department of Biochemistry at the University of Alberta. She received her B.Sc. in Microbiology from the University of British Columbia and her Ph.D. in Genetics from the University of Alberta, followed by postdoctoral training at the Fred Hutchinson Cancer Research Center in Seattle, Washington. Her research interests involve the regulation of RNA polymerase II transcription in cancer cells, cells infected with DNA viruses, and cells traversing the mitotic phase of the cell cycle. She has taught courses in biochemistry, genetics, molecular biology, and oncology, at both undergraduate and graduate levels. In addition, she has written booklets in the Prentice Hall Exploring Biology series, which are aimed at the undergraduate nonmajor level. Michael A. Palladino is Dean of the School of Science and Professor of Biology at Monmouth University in West Long Branch, New Jersey. He received his B.S. degree in Biology from Trenton State College (now known as The College of New Jersey) and his Ph.D. in Anatomy and Cell Biology from the University of Virginia. He directs an active laboratory of undergraduate student researchers studying molecular mechanisms involved in innate immunity of mammalian male reproductive organs and genes involved in oxygen homeostasis and ischemic injury of the testis. He has taught a wide range of courses for both majors and nonmajors and currently teaches genetics, biotechnology, endocrinology, and laboratory in cell and molecular biology. He has received several awards for research and teaching, including the 2009 Young Investigator Award of the American Society of Andrology, the 2005 Distinguished Teacher Award from Monmouth University, and the 2005 Caring Heart Award from the New Jersey Association for Biomedical Research. He is co-author of the undergraduate textbook Introduction to Biotechnology, Series Editor for the Benjamin Cummings Special Topics in Biology booklet series, and author of the first booklet in the series, Understanding the Human Genome Project. Darrell J. Killian is an Associate Professor and current Chair of the Department of Molecular Biology at Colorado College in Colorado Springs, Colorado. He received his B.A. degree in Molecular Biology and Biochemistry from Wesleyan University in Middletown, Connecticut prior to working as a Research Technician In Molecular Genetics at Rockefeller University in New York, New York. He earned his Ph.D. in Developmental Genetics from New York University in New York, New York and received his postdoctoral training at the University of Colorado Boulder in the Department of Molecular, Cellular, and Developmental Biology. Prior to joining Colorado College, he was an Assistant Professor of Biology at the College of New Jersey in Ewing, New Jersey. His research focuses on the genetic regulation of animal development and he has received funding from the National Institutes of Health and the National Science Foundation. Currently, he and his undergraduate research assistants are investigating the molecular genetic regulation of nervous system development using C. elegans and Drosophila as model systems. He teaches undergraduate courses in genetics, molecular and cellular biology, stem cell biology, and developmental neurobiology. When away from the classroom and lab, he can often be found on two wheels exploring trails in the Pike and San Isabel National Forests.